Many people who need palliative care prefer to stay at home for as long as possible. Usually care will be provided by the GP and nursing services. Dedicated palliative care services are available but these may only be provided to people with medically ‘complex’ cases. To find out about locally available palliative care services you should talk to a healthcare professional or you may want to refer to this guide which provides details on some of the palliative care services available across the island of Ireland. Services available within Northern Ireland are also available on the Health and Social Care Trust websites. To access many of these services, you will require a referral from a GP. What can we expect from palliative care in our area? What are your recommendations for our care? How do we get access to health care services? Who will provide palliative care? Where will our care be provided? What decisions need to be made by my family member and me? What resources are available to support carers? What services are available if you require palliative care at home? You should speak to your GP or other healthcare providers about services that may be available in your area and, if these are services that you have to pay for. Many people enjoy providing care but sometimes, the demands on you and your time may feel overwhelming. You may feel tired, frustrated, angry, or upset – this is normal. If things feel like they are getting on top of you, speak to a healthcare professional, they will be able to give you advice about how to manage your situation. What do family carers usually do? This depends on the person’s needs, your relationship and what you feel comfortable doing. Some carers provide support by listening and offering comfort. Others provide help with meals, medications, transportation and organising appointments. Some carers may be happy helping with practical caring tasks such as personal hygiene/bathing, grooming and skin care. If you are unsure about providing care discuss it with a healthcare professional and ask if you need something explained. Remember, if you do not feel comfortable or confident in providing particular types of care, you should make this clear to the healthcare professional so that alternative options can be considered. You may be providing care for the first time and in need of help with particular tasks. You should ask a healthcare provider to show you what to do until you are confident that you can try it yourself. It’s a good idea to practice caring skills when a healthcare professional is there to guide you. There are also websites which provide guidance on some simple caring tasks or you may want to contact one of these helplines. Remember - everyone’s needs are different – don’t feel embarrassed by asking for guidance, no matter how simple the task may appear. Care with Confidence - Caring with Confidence helps unpaid carers make a positive difference to their life and that of the person they care for. If you help or support a family member, friend or neighbour with a long-term physical or mental health condition, disability or problem related to old age, Caring with Confidence can help you develop your skills and knowledge for your caring role. 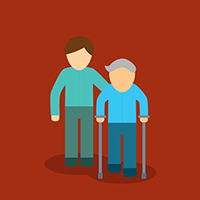 What care can I provide if my relative is unable to be at home? Many people receive palliative care in a hospital, hospice or nursing/residential home. It doesn’t matter where your relative is living, you can still provide hands on support, if you wish to. For example, you may still want to help with meals or personal hygiene when you visit. Talk to a senior member of staff about how you can continue to contribute to your relative’s care. It is important that you are aware of your rights and some of the things you can do as a carer. Access information to help you provide care. Complain about services if you feel they are unsatisfactory. Access additional supports such as home help, meals on wheels, nursing assistance. Ask any questions you like. Write down questions as they occur to you – you can then refer to them when you meet with a healthcare professional. If you have a medical concern talk to a healthcare professional. If you have concerns about finance a social worker may be able to advise you. If you are unsure whom to ask, contact your G.P.’s surgery and they will tell you who can respond to your query. You may want to deal with everything yourself but remember support is available to you via telephone helplines and websites. Don’t worry that your questions may seem silly – healthcare professionals are used to dealing with queries. It is part of their job. When should I call healthcare services? Across Ireland, palliative care is usually provided by your GP and District Nursing services. There are specialist palliative care services but these are usually for complex cases that require specialist help. Access to specialist services is usually organised by your GP or other healthcare professional. Making an early phone call may reduce worry by providing you with the advice or reassurance you need. It is a good idea to keep helpline phone numbers in a prominent place e.g. by your phone or on the fridge. Helplines that may be able to advise you include the Marie Curie support line, Macmillan Cancer Support helpline in Northern Ireland or Family Carers Ireland Careline in the Republic of Ireland. Do we need a GP? Your relative’s GP is likely to be a key contact in providing access to services. If they are not currently registered with a GP here is some information which will help you . If you live in the Republic of Ireland it is important that your relative is registered for a medical card. Here is some information that can help you. Deciding when to call the doctor can be difficult but if you have any concerns you should seek advice. If you are unsure call the doctor’s surgery and talk to either the GP or a nurse. Explain the problem and they will be able to advise you. How will being a family carer affect you? “No one had told me of the potential benefits of caring for Lisa. In the tough times, it was certainly hard to see any positives, but they were there, they were just a bit difficult to find. Looking back on the experience, I have definitely benefitted greatly. Not only do I feel good about being able to have provided support to Lisa but I also feel as though I have learnt much more about life and myself in general. Caring for Lisa has been the most powerful experience of my life”. “My partner and I have become closer through this experience”. “I feel like I am a stronger person now”. You are taking on a very difficult role. It is okay to feel overwhelmed at times. There are people to help you. You can take time and arrange to do something that will make you feel good. No one is perfect but you are doing the best you can. For some people, caring can be an incredibly rewarding experience while others may find it stressful. You should recognise when you feel stressed, it is a normal response to a difficult situation. You may want to discuss your situation with family or friends or contact a helpline but, if you think it will help, you should seek some form of support.